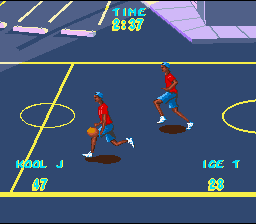 This is a really early demo for a basketball game featuring rappers. It was called "Rap Basketball" by the developer, but there is no way to know what the final title would have been. Thanks to Merp, who conducted the interview with Joseph "Holy Joe Rock & Roll" Moses, and to Joseph Moses for providing the binary! This game is a rather incomplete half-court basketball video game that was supposed to feature rappers Ice-T and LL Cool J. The development team was contracted to make the game by an outside company (presumably Eware), but since that company went under, so did Rap Basketball. This publisher supposedly had licenses from the rappers, but the developers are kind of skeptical about it. This game is completely unrelated to Mandigo's Rap Jam Vol. 1, and was being developed earlier. As you can see, this game is an early alpha. The basic gameplay is half-court, 2-on-2 basketball. However, your opponents are frozen in place, your teammate just follows you around, and you can't score points. The basketball is controlled with the A button, which causes it to bounce around (you don't need to hold the ball to make it bounce). You make your character run with the X button. Since you can't shoot, playing this is rather pointless. 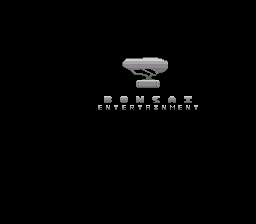 Pressing start brings up the company logos. The background graphics are fairly nice, but the sprites are faceless and poorly animated. On a nicer note, the music track is very cool. Below is an inteview conducted by Merp with developer Joseph "Holy Joe Rock & Roll" Moses. Merp: For 'Rap Basketball', what companies were you freelancing for? Holy Joe: OK, RBB was a real cluster-fu*K.
Our original contract was with a company in Tahoe, CA [E*WARE?] who claimed to have a deal with Motown-Games. Then he never paid us and vanished into out-of-business. I contacted Motown a few months later (finally) and they had signed another deal with someone for RAPJAM vol.1. They claimed to not know we were doing the actual development work. Then we had a second contract with a publicly traded company. These guys bounced our 1st check and refused to pay us. I sued them and forced then in to bankruptcy, then they vanished. Rough business, these guys really sucked!! Merp: Did you have any contact with LL Cool J or Ice T's managers? Naw, I'm just kidding. I never met these guys. LAUGHING OUT LOUD. Merp: Was Rap Jam Vol. 1 planned before Rap Basketball or after? Holy Joe: Developed after and by someone else. Merp: What made you stop developing Rap Basketball at such an early state? Holy Joe: We never got paid :-( IT really sucked. 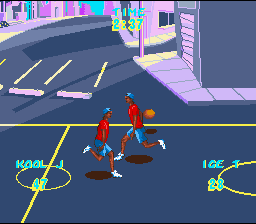 Merp: Around what year were you developing Rap Basketball? Holy Joe: It was in mid-late 1994 if I remember correctly. 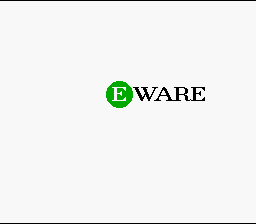 Merp: Did you have the license arrangments made with Nintendo yet? Holy Joe: We would have been all set. We were licensed developers and the publisher would have been ok.
Merp: Who was your artist at the time? Holy Joe: There were a couple of artist. My brother Charles worked on most of it - but also a guy from Tahoe did some of the early stuff. Merp: Who programmed the music? It sounds an awful like a Genesis chiptune that was recorded and tracked. Holy Joe: I think we just dropped something in there as a place holder. Merp: What was your impression about the game? Did you want to program it? Holy Joe: At the time we were pretty excited. No one had done a Rapper based game like this YET. We wanted to finish it. Merp: Finally... Why wasn't it finished? Holy Joe: Well, since we never got paid, we had to do something else that would make us some $. We just could not survive doing stuff for free.